Garmin Fenix 3 vs. Fenix 3 Sapphire - What's the Difference?! » Garmin Fenix 3 vs. Fenix 3 Sapphire – What’s the Difference? The Garmin Fenix 3 has become one of the most popular GPS multi-sport tracking watches available. Garmin has now released the Fenix 3 Sapphire, and many potential users are wondering: what's the difference? Read on for our review and comparison of the Garmin Fenix 3 vs Fenix 3 Sapphire. 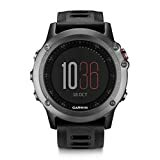 ​Both the Garmin Fenix 3 and Garmin Fenix 3 Sapphire are multi-sport tracking watches with their main feature being GPS tracking. These watches can be used to track activities such as running, cycling, swimming, hiking, rowing, golf, and more. Pretty much any physical activity you can think of. Fenix 3 Sapphire - best choice? The Garmin Fenix 3 Sapphire (Amazon) has one major feature that the normal Fenix 3 lacks: a sapphire lens. It's easy to see where this watch gets its name! What exactly is a sapphire lens, and how does it make the watch better? In short, the Sapphire version of the Fenix 3 is tougher and more aesthetically pleasing than the normal model. The domed sapphire lens is a little more aesthetically pleasing with a silver accent color around the display. SUP/Rowing Profile: Measure paddle stroke count, stroke rate, distance per stroke to determine efficiency. ANT+ supports wireless sensors like heart rate monitor, tempe etc.